(our tub is relocating to where the sink was so we plan on using the sink supply and drain location, the sink is very close to where the tub supply was so we'll use those supply lines and drain for the tub, the toilet is going to a new location, we have great access from the basement for all these moves) we have a 6" abs drain that is also easy to get at, my concern is the vent..it is a 6" vent as well and its currectly at the tub end of our project, the toilet will end up being approx 10 feet away from the vent, with both the tub and sink drains tying in to the main drain before the toilet, is this sufficient venting ? I don't think so. Depending on where you live (so I would check with a local plumber or even a plumbing inspector) the wet vent for the toilet should be no further than 5 feet from the stack. You will have to run another smaller vent pipe and tie in above the sink height (usually done in the ceiling). But again check with a local to see what the correct distance is. 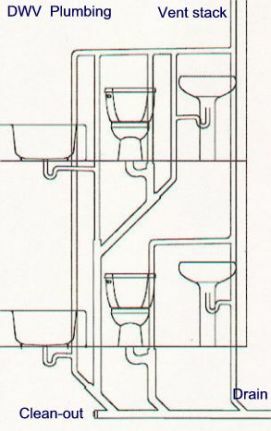 Is the sink and tub already vented above the ceiling? If so maybe you could tie into one of those. Here is some more info on how to vent various fixtures in different locations... Hope this helps too!